Do you know all applications of hot water bottle? Cherry stone warmer manufactured by Medi Partners company is a natural and effective way to eliminate many unpleasant and troublesome symptoms at babies and adults. They are pleasing to the eye, pleasant for the body – they can fit to its shape. They can be warmed up in microwave or oven, but they can also cool the body. Hot water bottle is suitable for cooling of swollen legs, as well as during the massage of tired backbone. Did you born a baby? After the childbirth use it as the cold compress to make the uterus smaller - a pleasant coolness is gently released by contrast with bags with ice cubes. Swollen and sore breasts - a cold compress eliminate the swelling. What is important - the materials used for production the pillows manufactured by Medi Partners are of the highest quality, and cherry stones are delivered from organic farming, so their use is also safe – they do not cause burns, frostbite, poisoning or allergies. Pleasant and natural source of heat, which calms andrelaxes the child. Polish natural and ecological product and aboveall it is safe. Hot water bottle from cherry stones meet the growing demands of young parents. They are an ideal combination of high efficiency and full naturalness. 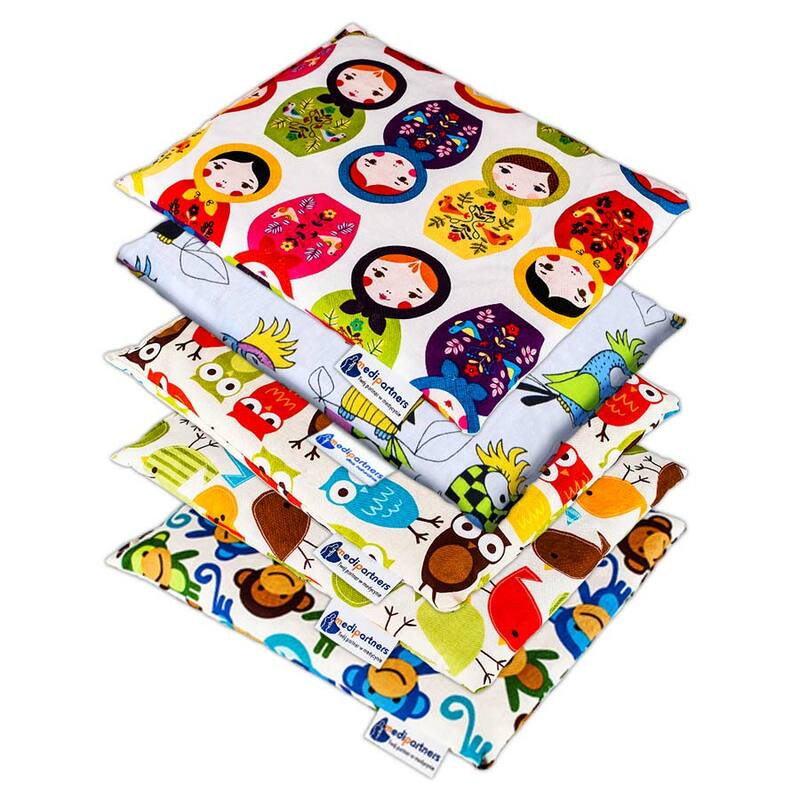 They are made from materials which are child- -friendly in 100 %. The basis for this material are properly drained and selected cherry stones. The best quality cotton is a complement to the whole product. The product is aesthetically packed and it is pleasing to the eye. Quality and safety gives it the advantage over the other usual hot water bottles filled with a liquid. 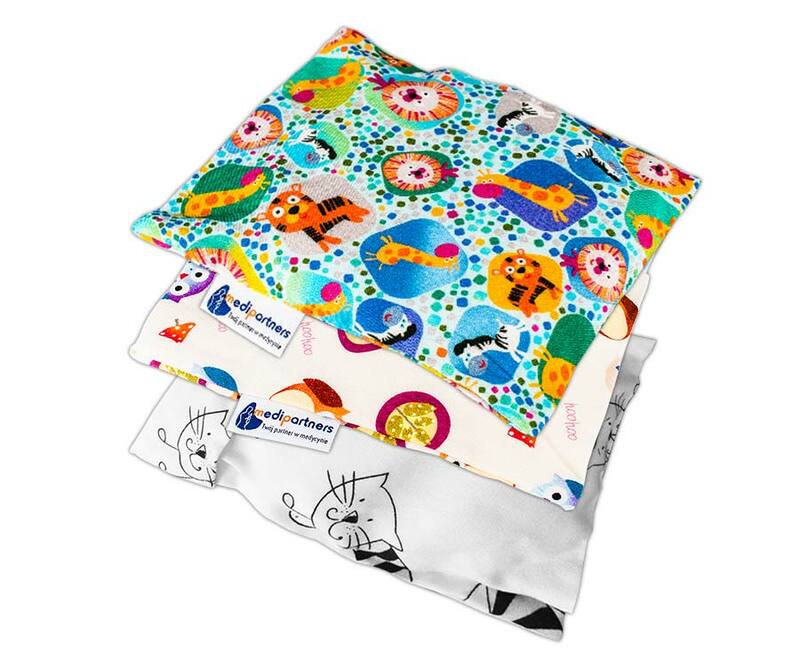 It keeps heat better and gives it off in a more natural way, and it is no risk of burning / damage to the baby’s skin. It is certified as a medical product which meets all the rigors of a marketing authorization in this form. 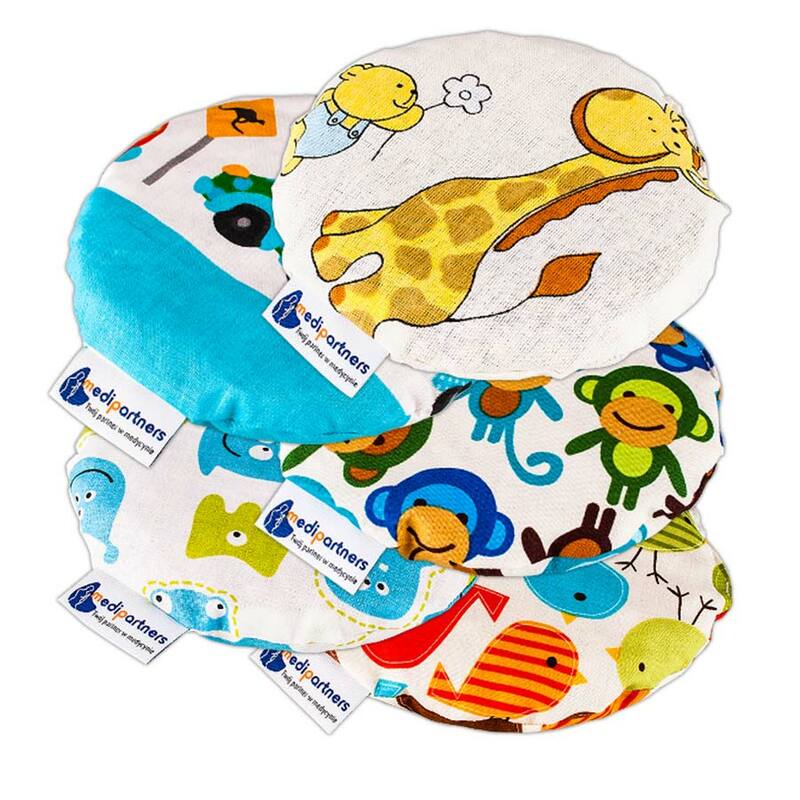 Cherry stone pillows for children have a circular shape with a weight of about 180g. so it fit fantastically to small tummy orother places. To heat the pillow, insert it into the microwave, oven, put on a radiator or any other source of heat. It will take off heat for about1-1.5 hours. To cool thepillow, just put it in a bag and put it in the freezer. Cherry stone warmers for adults are particularly recommended as a cold compress for women during confinement. They are ideal as a compress for making the uterus smaller or when you need a compress on the breast. Thanks to specially selected cherry stones and an appropriate way of drying, compress has never „shrunk” – when it is taken from the freezer it still retain its shape and flexibility. One of the biggest advantages of this pillow is that you can use it in any position as it fits to the body. You just hest / cool it and it is immediately ready for use. It does not create any typical problems as other hot water bottles: whether poured water is properly heated, does a plug match to the seal, is air out, etc. - a compress for making the uterus smaller or a compress on the breast. Cherry stone warmers for adults have a rectangular shape with dimensions of 20x25 and they weight about 500g, so they ensure a greater heating surface. The fit perfectly to a particular place. Hot water bottle is registered as a medical device and meets all the rigors of admission to market in this form. It has wonderful pro-health properties. A number of studies over the bamboo fiber has confirmed that the bamboo is non-sensitizing, has the ability to eliminate bacteria from its surface and it does not irritate the skin but treat it. It also absorbs odors. It is reliable for allergy sufferers and people with sensitive skin. By placing a warmer in the band we are sure that it is exactly where it should be. Band is fastened with Velcro and prevents moving of the pillow, as it often happens during the child sleep. This solution significantly increases the practical application of the cherry stone warmer. Medi Partners company was founded in 2010 in order to provide safe and non-chemical methods of care for infants..